This was the tricky part, sewing the handles in long, straight lines then sewing across the bottom of each strip. 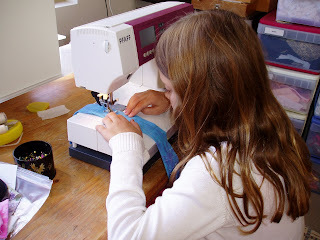 At this point I decided to teach her how to sew in reverse and then forward again to secure the ends of the straps. Her eyes were like saucers when I pushed a knitting needle into the strap and she pulled them inside-out to the right side. Talk about concentration!! I told her that the black pin-tin (actually papier mache) belonged to her Gramps's Grandma so it is very old. The matching lid is on the table somewhere. All I did with the straps were to fold them over lengthwise and put pins in to hold them plus rule the pencil line - Tay did the rest. This is the tricky part but look at that consentration! What a lovely thing to share with your granddaughter and that you have history in and around the room (pin tin) to share with her is even better. I hope to pass on some of my favorite pincushions some day. Making a bag is another perfect thing to do with a child. Great job!